The post is a technical review of Carvana $CVNA. The technical posture of the stock is given along with the key trading levels and potential trade entry and price objectives. Carvana is an online used car dealer that sells, finances, and buys back used cars through their website and is headquartered in Tempe, Arizona. The company delivers cars to customers, or customers can also pick up their purchased vehicle from one of the company’s car vending machines. What makes Carvana so unique in the industry is the asset-lite nature of it’s business model. A typical used car dealership takes upwards of $10 million dollars of initial capital to get into business once land, buildings, inventory and staff are considered. Carvana can establish itself in a location for around $500,000. It’s online marketing model enables a bare-bones staff to operate on a very small physical footprint. One additional point is that buying a car online, often sight unseen, is increasingly an appealing option for millennials. There’s only one problem…..they don’t make money. Like many other new companies, Carvana is spending money like drunken sailors to establish themselves in as many markets as possible as fast as possible. I am a technical analyst so I don’t pay attention to analyst opinions, I pay attention to the charts. But just for fun I thought I’d take a quick look. According to Finviz between Aug 2018 and mid Dec 2018 B Riley, BAML, Wolfe Research and Citi all either initiated or reiterated BUY / Outperform ratings on the stock with price targets ranging from $55 to $76. Interestingly, with the stock near $36 in mid January, Morgan Stanley hits it with an underweight and $23 target. That’s a lot different than $55 or $76. Remember that $23 target, it will come up later. What can the chart tell us? To my eye, the price action sets up as a classic head and shoulders top. When this type of formation executes they are very powerful. You can see the well-defined neck-line of the formation at $37.50. In Dec 2018 price punched through the neck-line decisively and executed the formation. What is interesting and a common technical move, is that price back-tested broken resistance at $37.50. Normally price would be rejected there and pull back. In this case, price broke through and even got through the 200ema. After that, you can see, price quickly faded away from the neckline. When dealing with a head and shoulders top, to calculate the anticipated measured move, you measure the height of the “head” from its top to the neckline. In this case its 45%. Then you subtract 45% from the neckline at $37.50. If you do that, you get a target close to $22. Pretty close to the Morgan Stanley target. Keep in mind, $CVNA has been executing this back test and fail during one of the most epic rips in $SPY in recent memory. What happens to $CVNA when / if $SPY has a modest pull back in the weeks / months ahead? To be honest, I missed the perfect entry near $37.50. I had been stalking the name, but once price took out the 200ema, I foolishly lost track of it because I did not re-set my alarms. Not to get off-track, but if a stock trips an alarm and you decide to pass on a trade, always take the extra 15 seconds to re-set your alarms at levels where you’d again like to take a look. You’ll never miss an opportunity again. Although the perfect entry has passed us by, I think there is still an opportunity to short this against the pivot point at $35. If you can tolerate a little more leeway, shorting against $37.50 is also a possibility. If neither entry appeals to you, there is a 3rd option: Hope price moves back closer to $37.50. Earnings is Feb 28. Maybe it pops up near the neckline for another bite at the apple. Although no set up is ever perfect, I think Carvana’s stock finds the low 20’s over time.That’s $10 of additional downside from here. If you can get an entry closer to $37.50, all the better. I have no reason to doubt that Carvana’s business is sound. Buying big-ticket items over the internet will become common place over time for a new generation of buyers. That said, companies that don’t make money get hit hard in a jittery market where strong balance sheets and solid revenue streams seem to take on higher importance. For me, all I need to see is the price action. The charts tell me this stock is out of favor and likely to head lower. We’ve been very fortunate over the past 6months. Our team has been winning, not perfect, but winning. I’d like to think you’d benefit from the work. 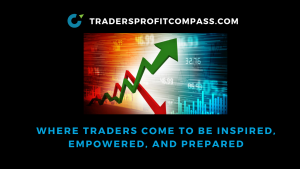 Join our Trading Tribe and you’ll receive a copy of my Daily Profit Compass, Weekend Profit Navigator, and other actionable content delivered directly to your mailbox. I will serve up lots of ideas for you to think about. . 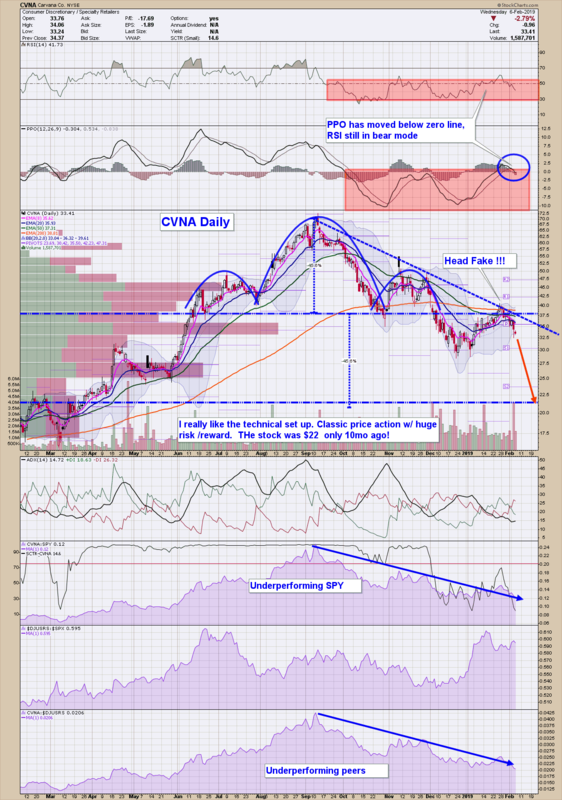 If your target is $22 on CVNA why is this a bad entry point if we are heading lower. Why would it retest 37.50? Why not just a a leap out option to give yourself time to let the trade workout? How would you trade it?